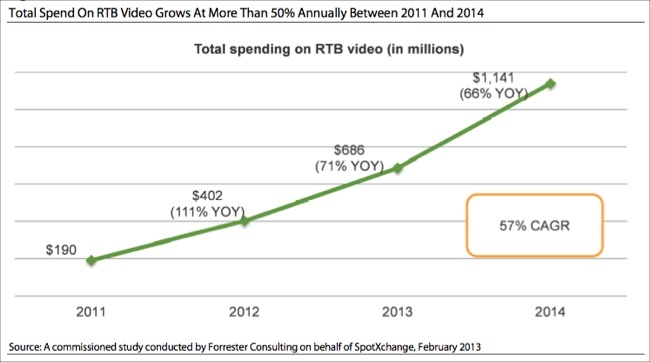 Forrester has updated its forecast for the real-time bidding (RTB) segment of the online video advertising market, calling for a 71% increase in 2013 spending to $686M and another 66% increase in 2014 to $1.14 billion (see chart below). 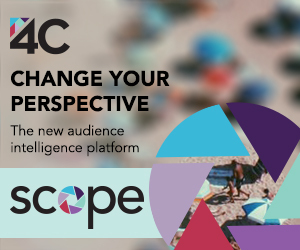 Forrester sees the increase in RTB spending accounting for 44% of the overall growth in online video advertising between 2012 and 2014. The forecast is part of a commissioned report for SpotXchange, available here. Forrester points to 4 drivers of RTB's rapid growth: more diverse pricing mechanisms that will increase RTB's appeal, especially for premium publishers; greater acceptance of RTB for mid-flight optimization; media buyers' desire to compliment traditional reach and frequency campaigns with targeted, engagement-oriented RTB campaigns; and automated RTB buying (and programmatic in general) that will reduce friction in the complicated online video market. As Forrester points out, to date premium publishers have been reluctant to open up inventory to RTB, since direct sales are robust. But numerous premium publishers have begun to try RTB, in a private marketplace model where they can control inventory and pricing. Forrester believes that as their inventory grows - necessitating a more automated approach - and they gain comfort with private marketplaces, RTB tools will gain acceptance. Still, Forrester sees 4 challenges to RTB going forward: RTB still needs to show it can support traditional advertisers' brand-lift goals; RTB isn't fully in synch with evolving TV-style gross ratings point oriented metrics; premium content providers' healthy online video inventory and direct sales, which diminishes interest in RTB; and confusion between in-banner and in-stream ad inventory. The first 3 challenges echo what I've heard in the market as well; I'm not sure I understand the 4th one. Despite these challenges, given Forrester's growth forecast, it clearly thinks these can be surmounted.